Here's an unusual photo. 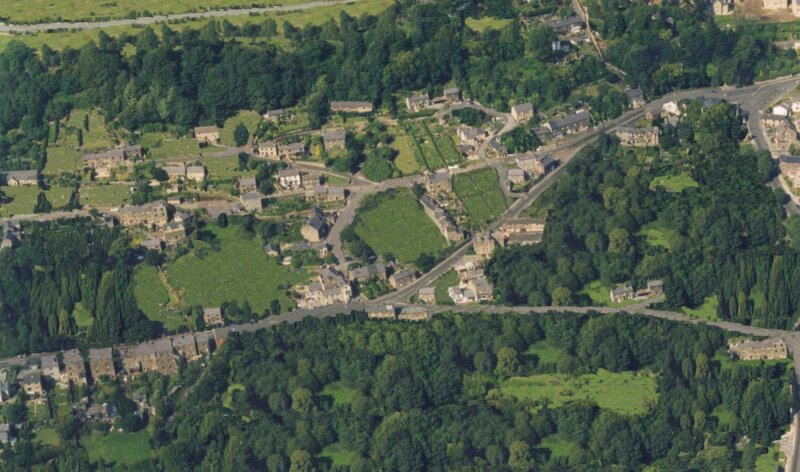 It shows the centre of Matlock taken from the air, in colour, as it was around 1840! My contributor says "The road parallel to the top of the picture is Bent Lane/Cavendish Road, the road at the bottom of the picture is Smedley St, road mid bottom to top right is Wellington St, road bottom right to top right is Dob Lane/Bank Road. The direction of view is due north, the white building almost centre is the Thorntree Pub (in Jackson Road). This was the most developed area of the Bank, There were no houses on Bank Road or Woolley Road, Cavendish Park is all farmland. Smedleys Hydro IS gone but its predecessor is in place on the corner of Smedley St/Old Hackney Lane and Bank Road/Dob lane. Smedley was to buy this building in 1853 and it was enlarged shortly afterwards. All Saints Church is removed while a modern extension to Jackson Tor House is left in place as it is on the site of long demolished buildings. Cobden Terrace makes a comeback between Cobden Road and Jackson Tor Road. According to the 1841 Census the greatest employment was Agricultural labourer, Framework Knitter and Cotton/Bleach mill worker. There was a huge expansion soon to come when the Hydros started up. In this photo alone 4 will be built in the next 30 years. Smedleys, Rockside, Jackson Tor House and a smaller one on Wellington St. All provided valuable employment when Mills like Smedleys ruined the Framework Knitters trade leading to riots, starvation and mass emigration - particularly around Nottingham." How was it done? "They were aerial photos taken last summer(1998) which I happened to come across.... The Photos have been 'airbrushed' to remove any house not built with 'hand pick dressed' stone and cross checked to some degree by the 1880 OS map and the 1848 tithe map of Matlock Bank. The Pick faced stone was the easiest and probably most reliable source for identifying still existing houses though - by 1880 all houses around here were built of cut stone. Apart from Maps, additional research involved walking round checking individual houses but there are some other details to mention. There is also the odd mistake, one or two of the houses bottom left on Smedley St should have been removed or had modern extensions brushed out. As far as technique is concerned, the work was done using Paintshop Pro on a Pentium PC. The photo is enlarged to work on a small area at a time and trees, grass etc are copied from one part of the picture and installed elsewhere. Best effect is by using the 'clone brush'. Other details, parked cars etc are brushed out by copying a bit of road over the top."